This is the website of the Food Demand Model, a statistical model suite to create long-term scenarios of global food demand. How much food will be consumed in 2050? Will we eat more or less livestock products? Understanding the long-term dynamics of global food demand is required to simulate long-term scenarios of the land use sector, and to estimate future environmental pressures like greenhouse gas emissions from agricultural production. Moreover, food demand scenarios can be an important tool for the analysis of future food security and human nutrition. The Food Demand model is based on a statistical analysis of global historical data, and can be used to create long-term scenarios of household food consumption (intake and waste) for all countries of the world. The Food Demand Model is an open-source model developed in the Landuse group. Fig 1: Exemplary model results for the per-capita food demand in 2005 and 2050. A visualisation tool, designed by Kai Schefferski, can be used to have a comprehensive look at some exemplary model results. It visualizes regional food demand scenarios for the 4 SRES storylines. Please note, that while this visualization tool only features 4 scenarios on a regional scale, the model is not restricted to these scenarios, but can be used to create new scenarios, and on a country-basis. If you prefer numbers, have a look into this Excel file. The model can be executed in the programming language R. For the creation of the storyline based projections, the R package CalorieDemand can be used. The food demand model is an open source project. We would be very happy if you develop the model with us! You can find the code on GitHub. Please contact Susanne Rolinski or Benjamin Leon Bodirsky if you want to join the development team! Are you looking for an internship at PIK or do you want to write your master thesis with us? Please contact Benjamin Leon Bodirsky or Susanne Rolinski! Also have a look at our potential topic list for master students and interns. Version 1.0 has been published in Bodirsky, Rolinski et al (2015). Archived stable versions: Model and visualisation tool. Bodirsky, Benjamin Leon, Susanne Rolinski, Anne Biewald, Isabelle Weindl, Alexander Popp, and Hermann Lotze-Campen. 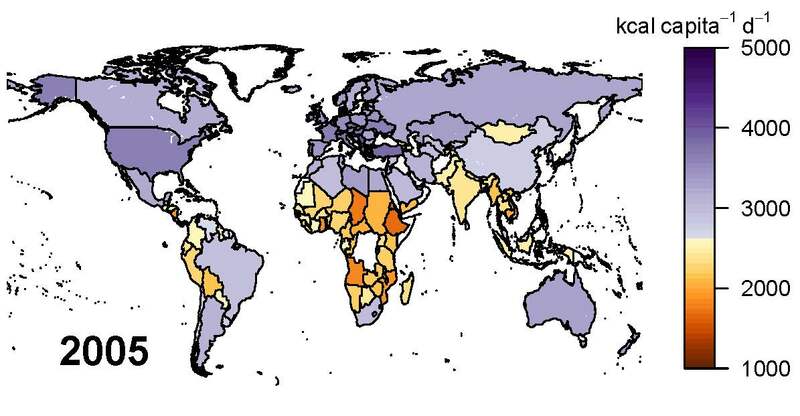 “Global food demand scenarios for the 21st century.” PLoS ONE 10 (11): e0139201. doi:10.1371/journal.pone.0139201. Open Access pdf.